Why drive anything but the best? The luxurious 2017 Volkswagen Touareg is equipped to handle all your automotive needs. With impressive technology, dynamic performance, and cutting edge safety features, the Touareg is the luxury SUV with a difference. Take a test drive in the 2017 Volkswagen Touareg today at Southern Volkswagen Greenbrier, serving Virginia Beach, Chesapeake, Norfolk and surrounding areas. The 2017 Volkswagen Touareg features the latest innovative technology to keep you connected and entertained. The 8-inch touchscreen is the center of your infotainment experience, displaying navigation, music streaming, and more. The powerful 2017 Volkswagen Touareg is ready for your next adventure with a host of performance features. The 3.6L V6 engine outputs 280 horsepower, while also staying exceptionally fuel efficient with an EPA-estimated 23 MPG on the highway. When you purchase the Touareg at Southern Volkswagen, you'll save thousands over the lifetime of your vehicle with our exclusive benefits package. It's easy to see why the 2017 Volkswagen Touareg is the luxury SUV for you. 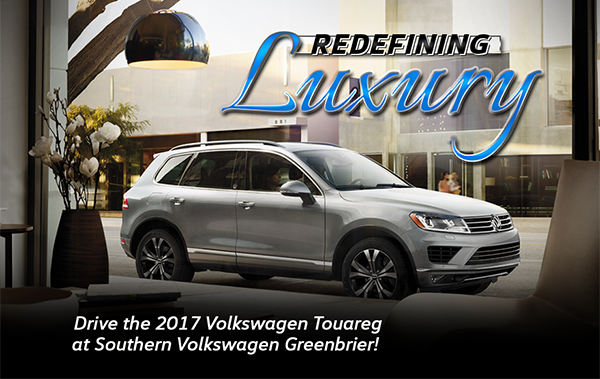 Discover all the amazing features today at Southern Volkswagen Greenbrier. We serve drivers in Virginia Beach, Chesapeake, Norfolk, Portsmouth, Newport News in Virginia and Elizabeth City in North Carolina.